Considering Instagram’s baked-in limitations, it’s a miracle the photo-centric social network has become as wildly popular as it has. After all, third-party apps aren’t permitted to upload images to the service at all, and nearly six years after the debut of the iPad, there’s still no tablet-optimized iOS update to be found. Instagram is also oddly walled off from desktop computers. Sure, you can use a web browser to search or view images, but it feels like something the company grudgingly maintains. Even after Facebook acquired the service in 2012, Instagram remains stubbornly mobile-first, despite the efforts of developers like ThinkTime, who keep trying to expand its reach. 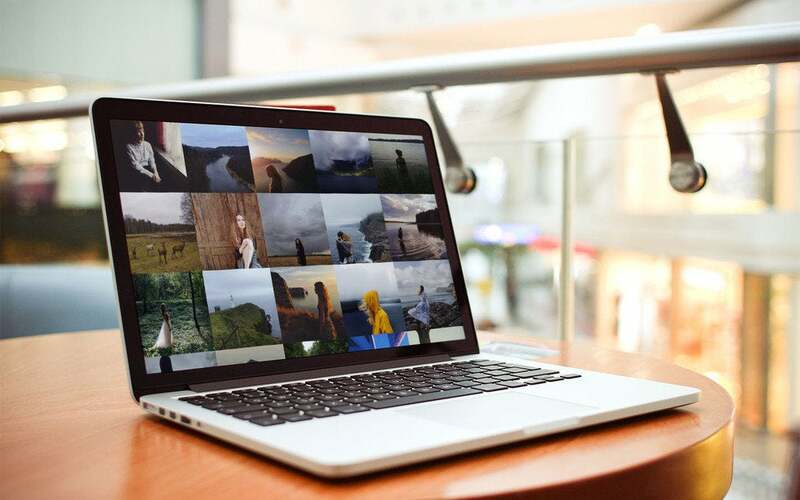 With support for Retina Displays and full-screen mode, Grids makes Instagram photos look their best on the Mac. 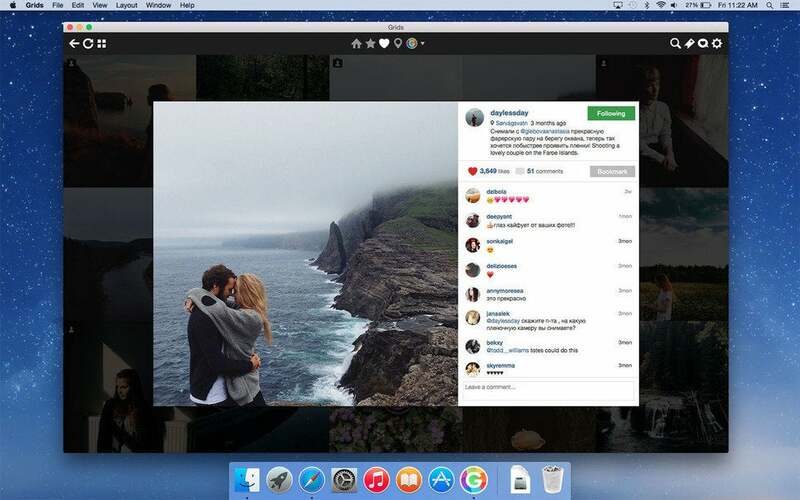 Grids for Instagram puts more emphasis on photos than user interface, and the result feels like a native Mac application Facebook might have built if they chose to do so. Although it can’t be used to actually upload photos from the Mac due to an API restriction, Grids otherwise improves the Instagram experience in several ways. First of all, there’s support for multiple accounts, and you can switch between them in seconds with the click of a mouse. For years, Instagram users have begged for this feature on smartphones, which comes in handy for those of us who depend upon the service for personal as well as business use. There’s also a universal bookmark option for specific photos, users, or hashtags, so you can find them again quickly from whatever account you happen to be signed into. No matter which account you happen to be using at the moment, the Grids bookmark feature can be used as a shortcut to favorite photos, users, or hashtags. Grids can display content in four different layout styles: Square (image only), Brief (image plus user details), Vertical (a close approximation of the Instagram app with the description and tags displayed at the bottom), or Horizontal (which relocates the description to the right side). I found Brief to be a nice compromise between eye candy and information. In all views, photos are displayed in a grid with no spacing in-between, but users can adjust this for some breathing room via Preferences, with a white or black background. Grids supports full-screen mode, which looks as great on a 27-inch Thunderbolt Display as it does on my 15-inch MacBook Pro with Retina Display. 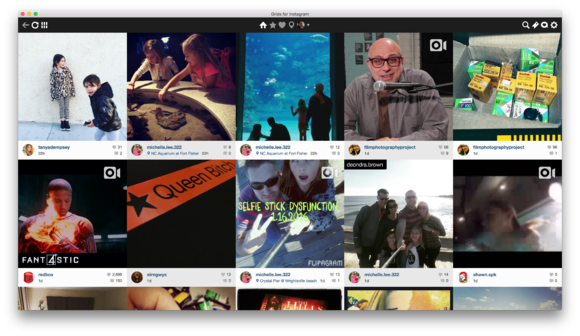 Grids for Instagram’s Brief view offers a nice compromise between visual eye candy and information about the photo. Clicking on an image (or pressing Return) opens in full-size photo view, where you can read or leave comments. Unfortunately, Grids can’t enlarge or otherwise resize in this expanded view; the zoom options in the View menu are limited to the main timeline. This isn’t surprising since Instagram doesn’t allow zooming on smartphones, although it’s technically possible, since third-party apps like Primary for iOS can do it. Grids offers keyboard shortcuts for nearly every feature. Press the L key or double-click to Like a photo, C to comment, or scroll one page at a time by pressing Page Up or Page Down (Shift-Space or Space will also work). Some options are also available via contextual menu with a Control-Click. Photo view displays an image full-size, but there’s no option to zoom or otherwise enlarge from here. One thing Grids doesn’t do as well as it could is actually share photos: There are options to copy or open a URL and save to disk (in full-resolution “HD,” if available), but there’s sadly no support the OS X built-in share extension. Having recently launched a social networking campaign that required a lot of sharing to Facebook, this would have been a convenient option to have. 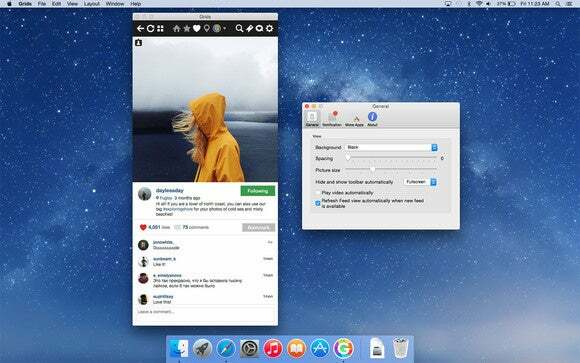 Sharing aside, Grids is an otherwise faithful Mac port of the Instagram experience, complete with conveniences like push notifications for new activity, customizable views, and automatic feed refresh while the application is open. Grids for Instagram includes preference settings for spacing, picture size, and background in the main view. 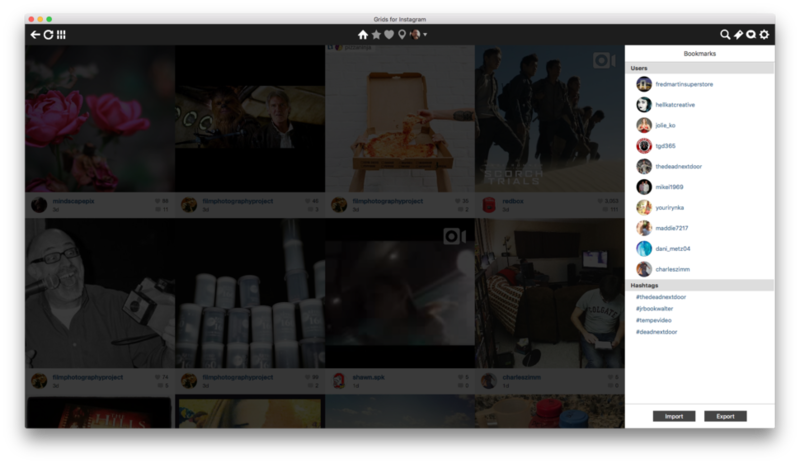 Aside from uploading and the lack of native OS X sharing, Grids delivers an authentic Instagram experience on the Mac, and actually does it one better with support for multiple accounts.